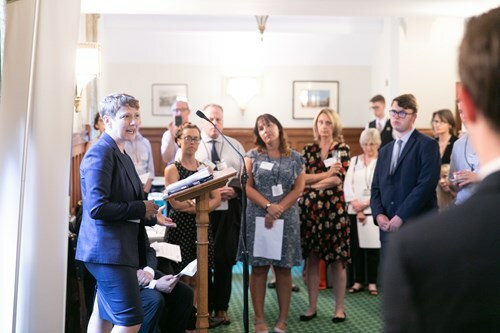 On Monday 9 July the All Party Parliamentary Group (APPG) on Rare, Genetic and Undiagnosed Conditions held a meeting on the effect of Brexit on European Reference Networks (ERNs). The APPG ran this event following guidance from Genetic Alliance UK. Alongside rare disease medicines regulation and access, and research funding and regulation, ERNs have been identified by Genetic Alliance UK as one of the crucial EU initiatives that may suffer if the UK’s terms for exiting the European Union do not take special account of issues for people affected by rare diseases – with negative consequences for patients and families across the EU. ERNs connect clinicians and researchers across Europe to allow expertise to be shared across borders, allowing faster access to expert advice, diagnosis and care. 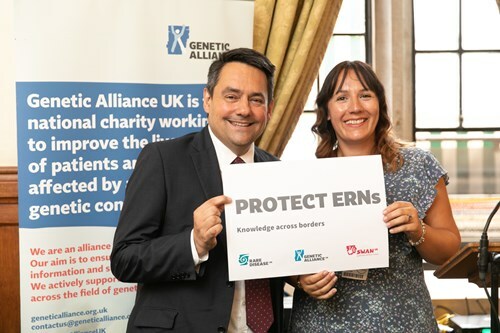 The meeting was opened by the APPG co-chair, Stephen Twigg MP, who described the potential of ERNs to transform the care and treatment of rare disease patients across Europe. The group then had the opportunity to hear from a series of expert speakers. 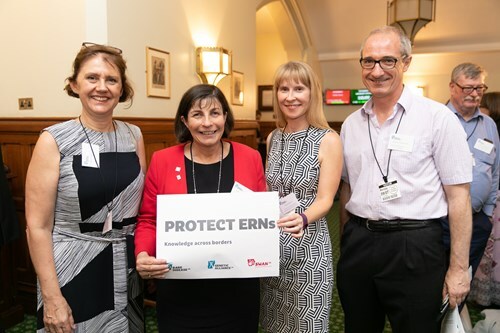 During Clare Moody MEP’s speech she emphasised the need to ensure the UK remains a part of the ERN process going forward, as ERNs offer support, improved diagnosis and opportunities to take part in research. Ms Moody noted that both patients in the UK and the EU benefit from the UK’s participation in ERNs due to the UK’s vast amount of expertise. However, she explained that there has not been enough conversation about these topics within Brexit negotiations and that these need to be brought to the forefront. Our second guest speaker, Professor Helen Cross, outlined the need for a targeted approach to rare and complex epilepsies, and how ERNs allow this. Professor Cross highlighted some of the ways EpiCARE, the ERN for rare and complex epilepsies, has been successful in producing registries and faster access to new technologies online. She stated that these collaborative opportunities have offered a unique opportunity for patients. However, there is still room for wider access to expertise and clinical trials, and this needs to continue following the UK’s exit from the European Union. Louise James offered the perspective of a parent of a child with an undiagnosed condition. Her son, Scott, has participated in research studies such as Deciphering Developmental Disorders and the 100,000 Genomes Project. She highlighted the importance of her son’s health data, in addition to the data of children from all over Europe in developing medicines and identifying new conditions. Louise showed how research, expertise, and knowledge within ERNs are key to helping families such as Louise’s. The next guest speaker, Avril Daly, offered the perspective of a rare disease patient and leading rare disease advocate. She described the potential of ERNs to revolutionise the way in which healthcare and research is delivered for rare disease patients. By pooling expertise and research, ERNs have the opportunity to achieve more for patients. She called for a Brexit that puts patients, their safety, and public health first. During his speech Professor Maurizio Scarpa discussed how ERNs are an ambitious example of collaboration that have led to better understanding of rare diseases and their causes. Professor Scarpa stated that the UK must be enabled to collaborate in ERNs, if we are to remain faithful to patients who should be at the heart of all decisions. This was further highlighted by Professor Márta Korbonits who discussed the way in which being able to communicate with hundreds of clinicians in a timely manner has helped to diagnose patients and to treat them effectively. The final speaker for the day, Senator Neale Richmond, warned that healthcare, and the future of ERNs, are not being discussed in Brexit negotiations but are of vital importance. He added that this is crucial to ensure that children in Ireland, and across Europe, are able to receive the best treatment that ERNs afford. 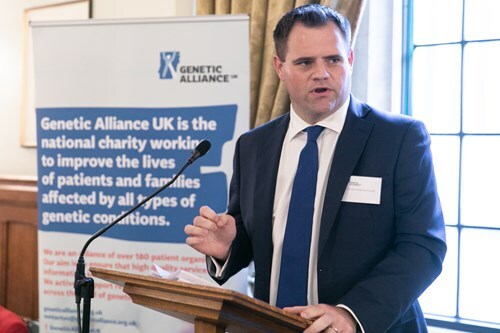 Following the APPG on Rare, Genetic and Undiagnosed Conditions meeting, Genetic Alliance UK, the Secretariat to the APPG, has agreed to develop a statement from the findings of the event. The European rare disease community will have the opportunity to support the statement which will be presented to the UK Government and European Commission. If you would like to see the live tweets from the event, a Twitter moment of the meeting can be found here. Photo credit: Josh Tucker/Genetic Alliance UK.